"Before snapshots, photography was difficult, technical, cumbersome—and reserved for experts like William Henry Jackson. 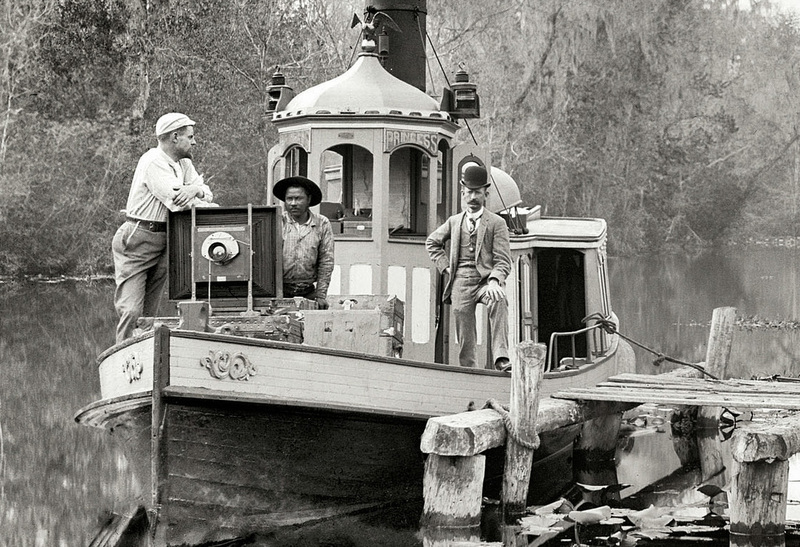 "When he started taking pictures, he needed a wagonload of equipment. Fairly quickly he reduced that to a load a pack mule could carry. Yet before he died, he was making color pictures with 35 millimeter film in a Leica camera. It took two men to mount William Henry Jackson's 'mammoth' view camera on a tripod. 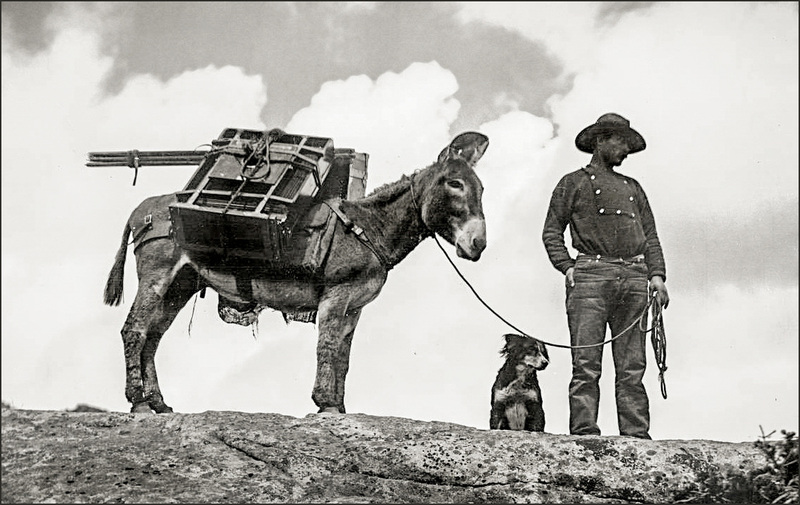 The 17" x 22" glass plates, and plate holders, can be seen on the other side of his pack animal. In the image below Jackson is seen kneeling next to his smaller 11" x 14" camera. He also used an 8" x 10" camera. The Colorado Historical Society received 53,879 glass plate negatives made by Jackson from 1870 till the end of his time with the Detroit Publishing Co. in the late 1920’s. 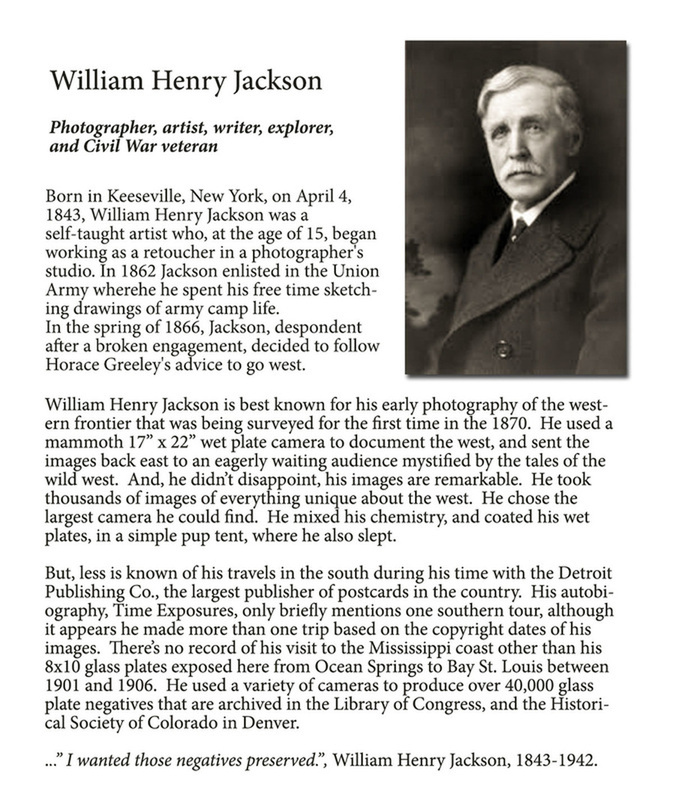 The collection was divided with the Library of Congress who got approximately 30,000 of Jackson's glass plates of the Eastern half of America, including foreign countries. William Henry Jackson posing for the camera in his darkroom. Notice the shadow of an enlarger on the left with a printing easel in the bottom corner, a large timer with a safelight just below, and an air vent for exhausting the toxic vapor. William Henry Jackson toured Silver Springs and the Oklawaha River with his Mammoth field camera that made 17x22 glass plate negatives. He used a variety of cameras including the field camera seen here that used 8x10 glass plate negatives. In the image to the right, Jackson and his assistant are mixing the chemistry to coat a wet plate for before exposure. The glass plate had to be coated in the darkness of his tent that he also slept in. The wet plate had to be developed immediately after exposure, also in the confines of his pup tent. A box of 8" x 10 " film holders can be seen at his feet. 'Manufactured' dry plates replaced the wet plate in the 1890's.